Thanks! Humor is basically my specialty and my pixel art is especially basic. Sorry about the ammo. The ammo crates are actually pretty low contrast even if you see colours fine. I intended to put a black border around them to differentiate then from the background, but kinda ran out of time. That still wouldn't have fixed that the red "ammo" is hard to read on the light brown background of the box. I wanted to just have the box have a picture of bullets instead, but the stuff I tried didn't look great. That interesting decision between catching bullets and dodging bullets was exactly what I was going for! So seems like I managed to do that a little bit! Au contraire, the glove is actually super op as there is almost no reason to not just hold left click the entire time (except that it might make the kid's small arm a bit tired). instead of the whole screen. However I did not finish the game so there may be a reason for being able to move the mouse on the entire screen. Also, this is just an idea (which may not be that great in practice, I don't know), you can keep it the way you want :). The font - ya, it is a bit hard to read. I know even I have trouble distinguishing a few letters. M and N I think are the worst for me. I seem to recall on the last project I did with this font, I strayed away from certain letters in my text due to that issue. Wish I would've remembered that two days ago. This font just happens to be one of the best on the Unity asset store for free. Others are either ugly or not even actually font, just the letters in a .png so I'd have to drag them in manually. I mostly intended for the game to be played in fullscreen. I think you would have just lost too much of the room if you played in a smaller window which would have made it unnecessarily hard. I could have made the text scale with the size of the screen and then it at least would have been playable, but when testing it, I just pressed play in fullscreen and it made the text readable so I didn't bother due to time constraints. For the mouse, it's only an aiming reticle like that so that I could hide the hardware cursor. I found when I just had the mouse hidden, I got a bit disoriented. I do like your suggestion. 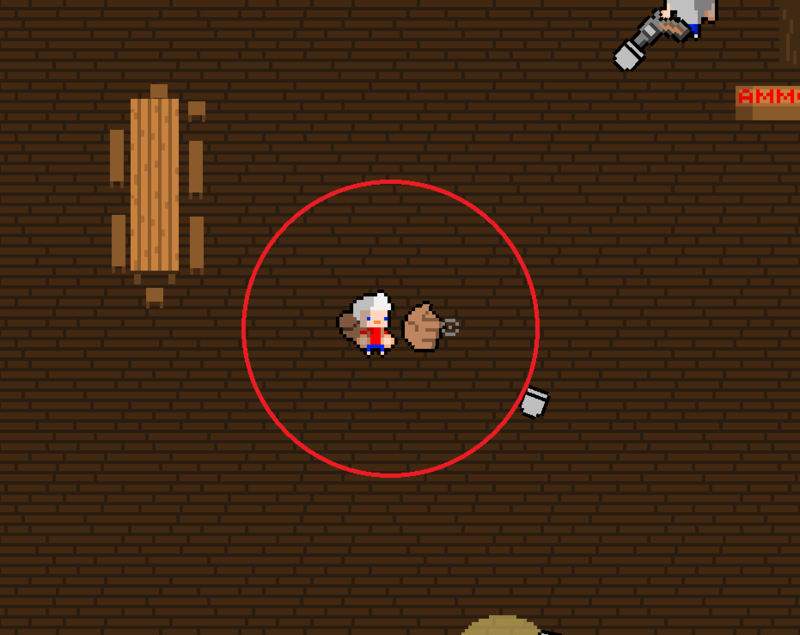 It would have made a bit more sense to have the mouse just be a little arrow or something and have it stuck to that red circle. I do have the technology, that's exactly what the glove is, it would just be a bit farther out from the player. So, I just tried out your suggestion a bit. I don't think it added more precision than just having the glove aim to where your mouse is (and have no mouse). It still had the same issue I found with not knowing how close your mouse was to your character. When the mouse is very far from your character, you have to move your mouse a lot to get it to rotate to where you want. When the mouse is closer to your character, moving it the same amount will probably shoot past your intended orientation. To fix that issue, I could potentially have the camera skew towards where my mouse is to subtly tell you where your cursor is without showing it. I have heard people say cameras like that can make them dizzy though. Or maybe another solution could be to not aim towards the cursor, but rather have moving the mouse just rotate your aim point around that circle at a fixed speed so that movement of the mouse always moves your aim by the same degree. loved the art, humor and plot!! xD , nice conept too bad it was kinda short and repetitive. Thanks for the kind words. I might have accidentally put more effort into art, humour, and plot. As a programmer. In a game jam about game design. Whoops. I was a bit afraid of it being not fun/repetitive. But at least it wasn't long and repetitive. Fun concept, I like the humor and also the art that seems to be inspired by Enter The Gungeon. Hey, I played your pig punching game once upon a time. I should actually play Enter the Gungeon one of these days. I could have thrown in some easter eggs instead of just borrowing their art style. Serioulsy ?! Haha Not a lot a lot people played this one. Fun game, surprising plot and overall great entry! The goals at 75 bullets and 350 bullets really encourage you to play better and more efficiently. I only wish I would've told the player in game about the 75/350 goals as it's kinda impossible to tell if the game is just endless or if you can keep playing until you reach 350. Oh man, I should've made an endless mode, then I could've gotten 6 stars. The graphics, animations, controls, THE PLOT! Thanks for the kind words! We all know the kid will be just fine. Display images are always where I have trouble. Do you know of any good resources or guidelines I could go by? My first thoughts would be that I should probably make my main character bigger, the title a bit small and neater, and a better background. Thanks for bringing it up because it's gotten me thinking about for the past ~2 hours. Edit: Alright, it was bugging me for hours so I changed it. 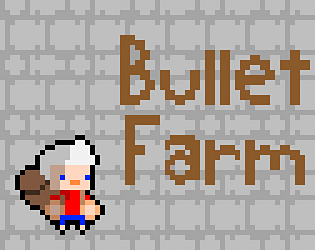 Looks a lot more appealing ;) hope you draw more people to your awesome game.